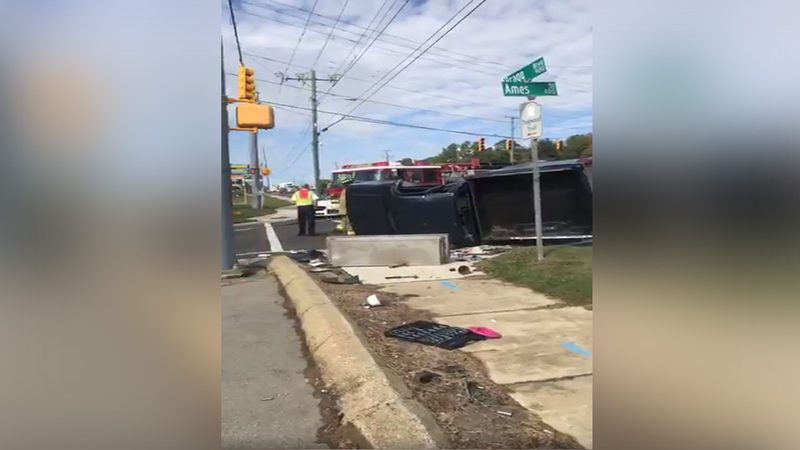 FAYETTEVILLE (WTVD) -- The Fayetteville Fire/Emergency Management Department is working to rescue two people trapped in a car following a multi-vehicle crash Monday morning. According to police, the crash happened just after 11 a.m. at the intersection of Bragg Boulevard and Ames Road near Brantley Electronic Supply Inc. According to crews on scene, it appears that the two trapped are adults. An eyewitness, who is an employee of Brantley Electronic Supply Inc., said he heard a "boom" and ran out to see the car flipped over. At least three people were injured; however, the extent of their injures are unknown.